jv16 PowerTools is a full Windows optimization utility suite containing 27 different main tools. Each of these tools is carefully crafted with the experience of 10 years of extensive Windows utility and registry cleaning experience to form a solid foundation to a smoother and faster system. 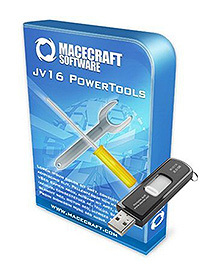 jv16 PowerTools 2009 optimizes, repairs, and maintains Windows-based PCs making them running fast, safe, and free of problems. Even the smallest details in the product have been designed with your ease of use in mind. The Windows Control Panel like user interface and the intuitive graphic tabs for example make the product easy to learn. And, the automatic backup creation makes it safe to use – even if you are learning by trying and make a mistake sometime, you can always just restore the backup created by the program and you’re safe again. New feature: Home screen feature in the main window shows you a summary of your computer’s health and performance, with shortcuts to the relevant tools to repair any detected issues. The home screen also allows you to see the progress of how these numbers changes over time, such as after using jv16 PowerTools. New tool: Startup Timer measures the time your computer takes to start up. It also measures the impact of all your automatically starting software have to the system startup to allow you to see exactly what is making your computer start slowly. New tool: Pictures AntiSpy allows you to remove privacy threatening metadata from your picture files. The feature can be used manually or it can be set run automatically. New tool: Windows AntiSpy allows you to disable the privacy threatening features of Windows. NOTE: Not yet available for testing in this beta version. Improvement: The System Health measurement has been completely updated to give you a more exact and detailed rating of your computer’s health. Furthermore, it is now ran as a background process, meaning you no longer have to wait for it to complete. It runs periodically on the background without using much if any system resources. Improvement: Major improvements in the Startup Manager. For example, it now can show the impact each automatically starting software has to the system’s startup speed. This impact measurement is collected in real-time while the system starts by the Startup Timer and it offers greater detail compared to Windows 10’s Startup Manager’s “Impact to startup” rating. The Startup Manager can now also show detailed data of the resource usage at startup time per starting software, for example, you will be able to see how much system memory each starting software used during startup. Improvement: The Initial Setup of the software now needs to be run only one time – instead of once every 15 days of the previous versions – and it also takes less time to run. Plus, hundreds of smaller improvements and bug fixes. NOTE: Not all improvements and fixes are yet included to this beta version, they are still under internal testing and will be included later. Bug fix: Running Clean And Fix My Computer in most aggressive mode can in some cases damage the Windows Start menu. This issue only affects the most aggressive scan mode and only very specific types of Windows 10 based systems. Bug fix: In Clean And Fix My Computer as well as other registry tools of the software, the top panel displays the currently selected registry key either in red or green, depending whether the key exists or not. In some cases, valid registry keys were incorrectly displayed in red. Bug fix: Fixed many grammar mistakes from the English user interface. Bug fix: The software can in rare cases display an error message of Access violation at address 006AE5AF. Bug fix: The software can in rare cases display an error message of Access violation at address 0047318E. Bug fix: The Open in RegEdit feature does not always work with the Registry Finder’s result window.